The biggest and well renowned exhibition of the gaming industry in Eastern Europe, will continue to be attractive power for international and local companies operating in the gaming and entertaining business to meet, network and establish successful business connections. During its 11th edition, which will take place on 21st and 22nd of November at Inter Expo Center, Sofia, Bulgaria, BEGE will firmly adhere to its own valuable mission, to support the business development of the region as a technology hub, to showcase all trends in the industry, and to constantly surprise its visitors with new activities. 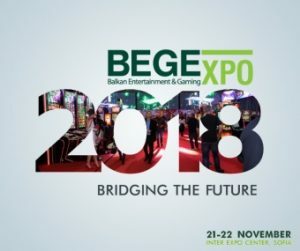 Among the great names of the gaming and entertainment business who have traditionally joined BEGE’s efforts to build up a better future for the industry are: Novomatic, Ainswort, Casino Technology, EGT, Suzohapp, BetConstruct, Interblock, Merkur Gaming, APEX, Alfastreet Trade BG, IGT, Zitro and more. The new gaming entities, who have been inspired to add value to BEGE’s mission (for the last few years the exhibition has doubled the volume of its visitors and the volume of the exhibition space) so far, are: Betegy, Efes Club, Jeton Wallet, Zeta Gaming, Altenar, Pragmatic Solutions and Wojskowe Zaklady Lacznosci Nr., G-Digital, DLV, Indoor Displays, Digitain. This year will make no exception in BEGE’s determination to pay closer attention to startup businesses operating in the industry. Startup companies are warmly welcomed to apply for the Gaming Startup Challenge – 3.0 on the website where one could also find more detailed information about the initiative. Within the first day of the exhibition, the traditional Miss Gaming BEGE will be held and the game of “searching the most beautiful face of the gaming industry” will be played once again. For the pleasure of all our participants, they will have the opportunity to vote and choose “Audience’s Favourite” which can win them a special prize. The registration for BEGE 2018 is now open. Prepare yourselves for a two-day stay in the future of gaming technologies and do not miss your chance to become a part of the next edition of the leading Central and Eastern Europian gaming and entertainment industry event. You may also want to take advantage of the many opportunities that the exhibition will provide for your positive corporate image and effective advertising presence. More info about the sponsorship packages available, you may find on the website.